Who is Indian Blue Chorus? 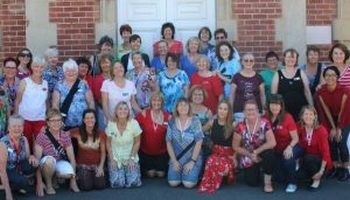 Indian Blue Chorus, a Western Australian women’s barbershop chorus, was launched on 19 February 2013 with a 6-week singing course. Indian Blue is a member of Sweet Adelines International, a singing organisation made up of 25 000 women worldwide, committed to advancing the musical art form of barbershop harmony through education and performance. Indian Blue Chorus’ primary aim is to sing and perform – but along the way, we know great friendships will be developed. 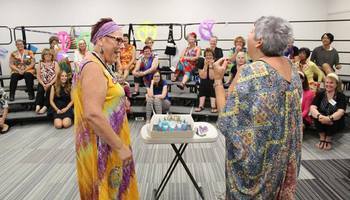 It is often said that women “join for the singing and stay for the friendships!” The chorus will provide education and training in a supportive and exciting environment from local, national and international coaches. The opportunity for personal growth is also a very important part of belonging to this organisation. Rehearsals are held on Tuesdays from 7.15pm to 9.45pm, please arrive by 7.00pm. Guest are welcome to stay for supper after rehearsal. Turn into Burns Beach Rd and head west. Go around the first round about after Marmion Avenue, so you are now heading east and TURN LEFT into Mattingleys Approach. Enter building from WEST SIDE (oval side). Want Indian Blue Chorus to sing at your next function? Why not hire Indian Blue Chorus to entertain at your next event? We can perform at corporate functions, charity events, community entertainment events, birthday parties, Christmas parties, awards nights, weddings, engagements, anniversaries and even funerals and memorial services.